Dhaka, 18 April, Abnews: A medieval treasure trove that belonged to the legendary King Harald Bluetooth — the Danish ruler who inspired the name for Bluetooth technology — was recently unearthed on a German island by a 13-year-old and an amateur archaeologist, according to news sources. The duo made the unexpected discovery while hunting for riches with metal detectors on Rügen, Germany's largest island, in the Baltic Sea. When a silvery glint caught their eye, they thought it was a piece of tin foil, but a closer look revealed that it was a piece of silver, The Guardian reported. 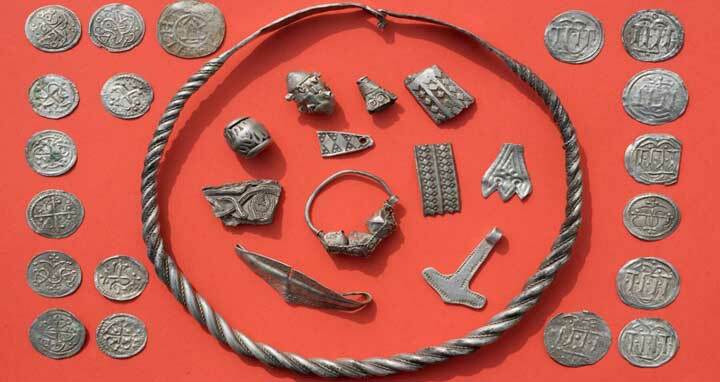 After more digging, with help from professional archaeologists, the team uncovered remarkable artifacts, including braided necklaces, pearls, brooches, a Thor's hammer (a representation of a mythical weapon forged by dwarves), rings and up to 600 chipped coins, including more than 100 that date to Bluetooth's era. "This trove is the biggest single discovery of Bluetooth coins in the southern Baltic Sea region and is therefore of great significance," the lead archaeologist, Michael Schirren, told the German news outlet DPA, according to The Guardian. Amateur archaeologist Rene Schön and 13-year-old treasurer hunter Luca Malaschnitschenko first unearthed the hoard in January, and recently joined a regional archaeology group to excavate about 4,300 square feet (400 square meters) to see what other treasures lay buried in the soil. Archaeologists believe the riches belonged to the Danish king Harald Gormsson, more commonly known as "Bluetooth," who ruled from about A.D. 958 to 986, and likely earned his nickname because of a discolored tooth, according to The Guardian. Bluetooth is known for bringing Christianity to Demark in the 10th century. He's also credited with uniting swathes of modern-day Norway, Germany, Sweden and Denmark under his rule. This feat inspired Intel's Jim Kardach to name the tech service in honor of Bluetooth in 1997, given that "the new technology that would unify communications protocols like King Harald had united Scandinavia," according to Tom's Hardware, a Live Science sister site.